Located in the rapidly-growing city of Leander, Texas, Hill Country Bible Church is developing a 19-acre site along San Gabriel Parkway. In an area formerly occupied by a chicken farm, the site is now part of a forward-thinking zoning district which requires an urban street presence with generous pedestrian accommodations. 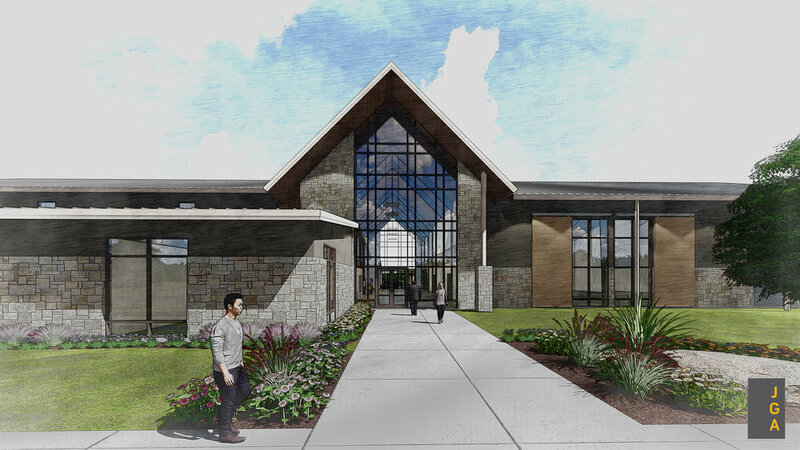 The first facility on the site will be a single-story multipurpose building in which a large, light-filled foyer connects a 500+ seat assembly for worship, administrative offices, a catering kitchen, and an expandable education wing. The site will also include 287 parking spaces and a water quality and detention pond.